Home › opinion › After 3 years of bianconera supremacy, what to expect in Serie A ? After 3 years of bianconera supremacy, what to expect in Serie A ? After spending three years with Antonio Conte on the bench, the bianconero fan in me forgot joyfully,the meaning of the word “defeat”. Now, with the boss gone, what 2015 will bring to us ? Conte’s exit, was a surprise because the problem seemed solved weeks ago, but also seemed really obvious. He asked for Juan Guillermo Cuadrado, he got the overestimated/injured Alvaro Morata ; he asked for a decent preparation in summer, he got a bizarre tour in Ocenia to meet the fans and had to stay in Turin before that … But most of all he saw an opportunity that looked even more important than the Old Lady’s well- being to him, La Nazionale ! Anyway, in 24h Massimiliano Allegri was taking his place, and he’s set to have a tough job to do. Will next season be much more exciting than the 2013/2014 one ? Next on the list, La Roma. Best manager of Serie A in my opinion (Rudy Garcia), great new signings strategy ( Juan Manuel Iturbe, Ashley Cole, Davide Astori…) and a strong , motivated team from last year’s achievements, already composed by great players like Gervinho or Miralem Pjanic and with legends as Daniele De Rossi or Franc’sesco Totti. 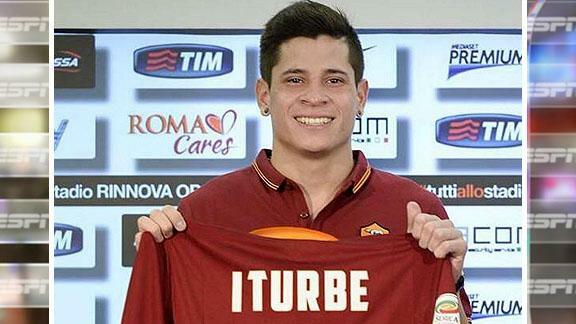 ”’ ”’ Iturbe with his brand new shirt. 30 million euros. ”’ g” ‘ ” ””” Pippo Inzaghi. Still in the same city, L’ Internazionale, have made a more intelligent recruiting from my point of view (Yann M’villa, Nemaja Vidic, Dodo) and they already have a good-looking team with experienced players helping the youngsters and they can totally pretend to be on the podium this year. We should never forget Fiorentina, lurking in the shadow as usually. They have Vicenzo Montella, Giuseppe Rossi, Mario Gomez, Alberto Aquilani, Juan Guillermo Cuadrado (or the money he’s worth anyway). I put them last in this piece, but not last in my mind. It’s always the team you forget until they beat all the League’s big shots and then you remember who they are. Oh… and they DON’T have Matri anymore, that’s a good point. The list doesn’t end here; they’re other interesting teams like Torino, Genoa or Verona, all of them able to be this year’s big surprise ! We’ll see, it’s just the beginning ! Which club do you favor for this season’s Scudetto ? ‹ Allegri, good enough to replace Conte ?